This sixth series of grOnk magazine – at this time, edited by bNichol with Steve McCaffery, bill bissett, dave uu “with an assist from rah smith and david aylward” – is devoted to the work of McCaffery. All but two issues (2-3 was published in 1970) in the series are undated but I’m guessing they were all published in the early 1970s. 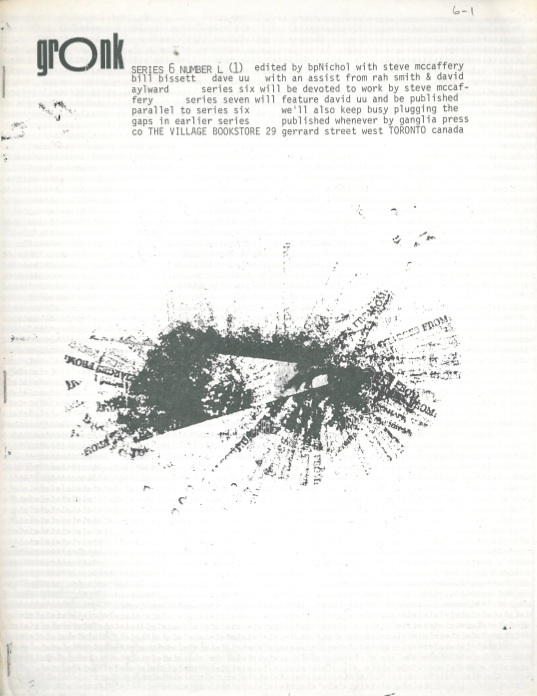 Every issue was published as single sheets of 8.5 x 11 paper stapled twice. 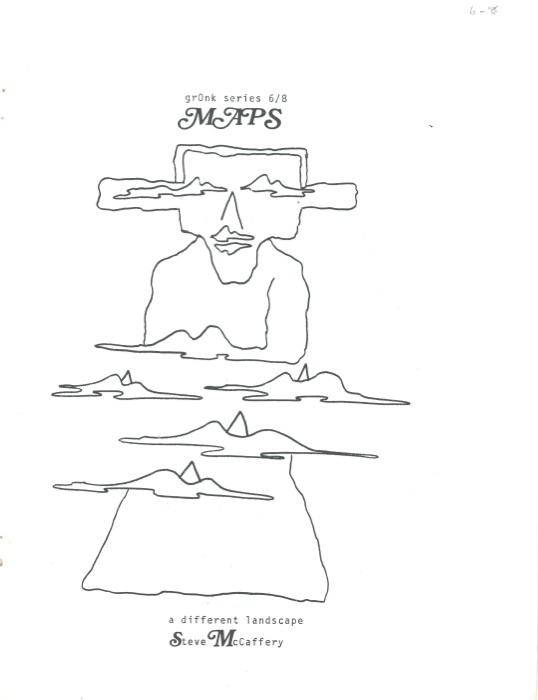 Issue one (download the pdf here) features five abstract concrete poems by McCaffery using typewriter, dry transfer lettering (I believe), stamp, and copier machine. to the beast are for me transitional pieces moving towards a hand drawn set of visual conventions that have their roots both in semiotic poetry & in the comic strip. 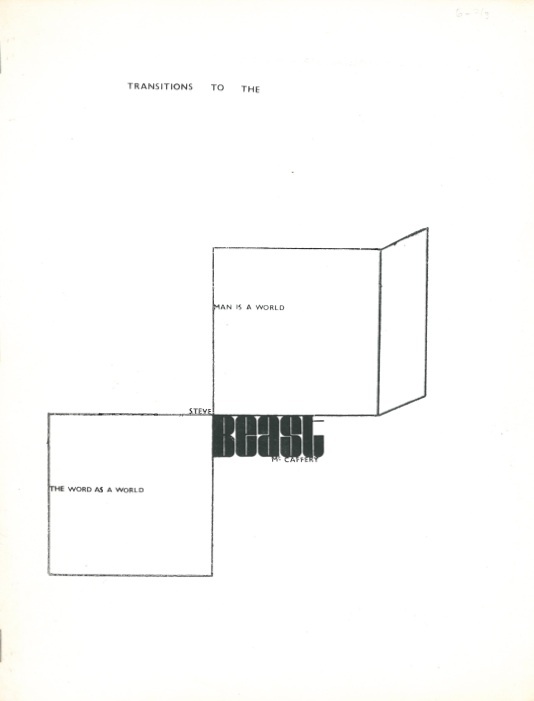 the semiotic or code poem (invented about 1964 by the brazilians pagnatari & pinto) uses a language of visual signs designed & constructed to suit the individual desires of the poet & the needs that he as linguistic designer assumes for the poem on that particular occasion of construction. 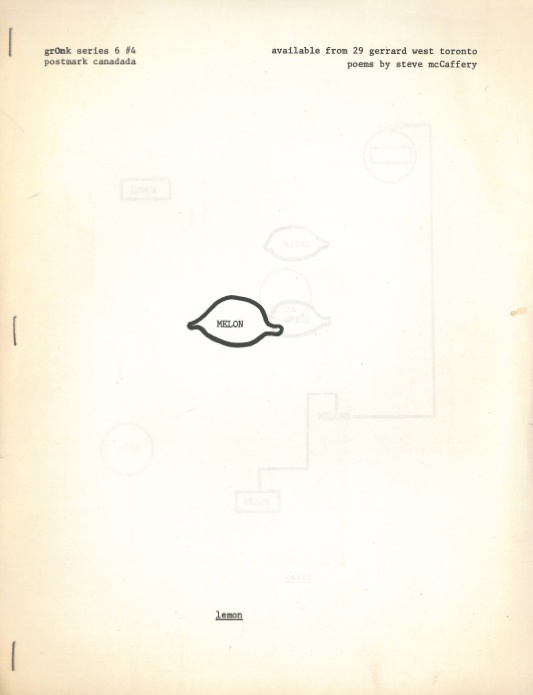 Issue four (download the pdf here) is titled, I believe “MELON LEMON” and continues McCaffery’s investigations into the visual, hand-drawn, typewritten poem that moves to the far edge of semantic meaning. 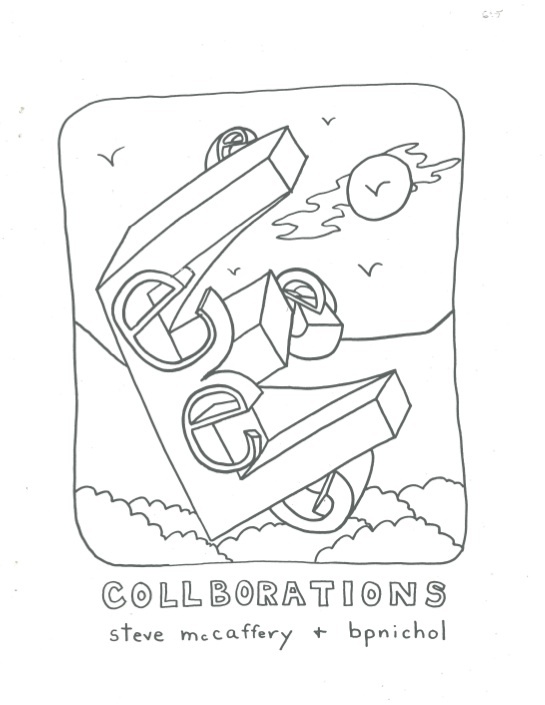 Issue five (download the pdf here) is “COLLBORATIONS” by both bpNichol and Steve McCaffery which does manage to appear as a perfect meshing of Nichol’s own comic-strip, hand-drawn aesthetic and McCaffery’s more abstract and geometrically precise concrete poems.